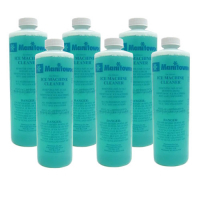 Manitowoc Ice Machine Cleaner/Pint - 16 OZ bottle of Factory Original Manitowoc Ice Machine Cleaner. Removes lime-scale deposits from Manitowoc ice machine bins and dispensors. All ingredients meet FCC specifications. Follow cleaning instructions label attached to specific Manitowoc machine being cleaned.